Do you like to open the windows in your house? Doesn’t this bring in fresh outdoor air to ventilate a stuffy house? The testing done by ROCIS shows that open windows are a mixed blessing in terms of particle exposure. In Pittsburgh, perhaps one day out of ten, outside air will be relatively low in particles, for at least a few hours.. 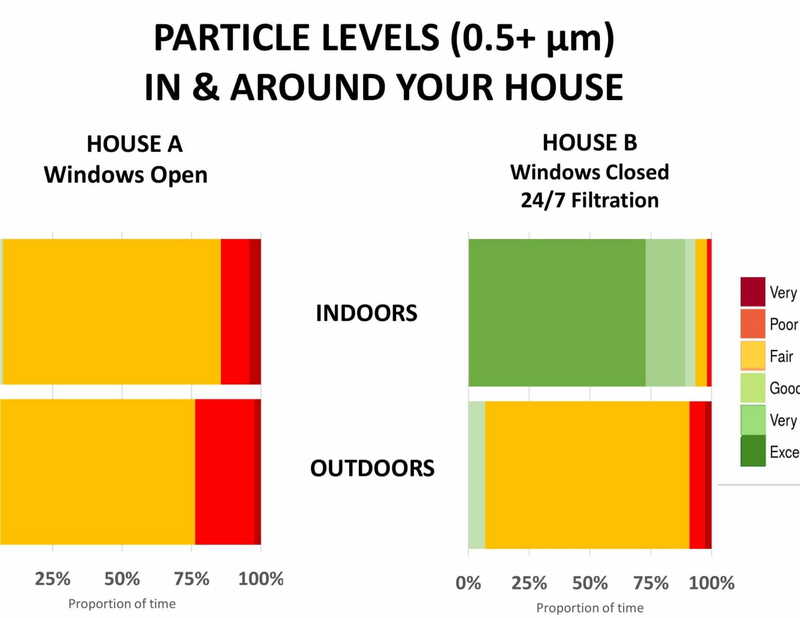 Most of the time opening windows and ventilating with outside air will raise the particle count in your indoor air. Open windows can bring in the smells, the sounds, and the freshness of outdoors. Open windows will also admit all the outside particles. If you are concerned about particle exposure, or you have family members with respiratory conditions, it may be best to keep the outdoors outdoor and the house closed up. Having a particle monitor helps make these decisions. * NOTE: The data referenced are from the Dylos particle monitor used by the ROCIS Low-cost Monitoring Project. This data represent counts of particles that are 0.5 micron and larger per 1/100 cubic foot. By comparison, a human hair is 50 to 60 microns in diameter. These numbers correspond directly to EPA ambient particulate matter guidelines. Within the ROCIS initiative we reference the scale provided by Dylos Corporation. It is not a health-based scale. Here is a screenshot of several days in March in Pittsburgh. The vertical scale on the left is the particle count: the horizontal scale is time. There are more than three days of data shown. For most of March 25, the Dylos total particle counts lingered around 500 counts. Pittsburghians could breathe easier. They could fling open their windows, were it to be warm enough. The outside air presented no threat. Below is an Excel spreadsheet of the one ROCIS participant’s results during that period. You can see by the yellow and blue lines on March 25 that the inside levels stayed flat and low because the outside particle count was minimal. There was also a short stretch later in the week on March 30 when the outside particle counts dipped to a record low of 100-200 counts early in the morning and pulled indoor counts down even lower. These areas are highlighted. There is another way to achieve low indoor particle counts without moving to Montana. You can control your indoor environment by having a tight envelope and filtering the air inside of it. For instance, the ROCIS participant below has indoor particle counts solidly in the green (Dylos “Good” to “Excellent”) in the second graph below as outdoor particle counts go up and down. Note that the outdoor particle counts during this monitoring were generally running between 1000 and 10,000 counts. Yes, the indoor counts do follow the outdoor trends to a small degree but they are in the order of 10-20 times lower than outside levels. Above: These graphs were generated from particle data for the week of May 2, 2018. During this week, ambient particle counts were much better than normal. In southwestern PA, the outdoor air usually is "poor", or "very poor" over 50% of the time, and if one's windows are open, indoor air will be even worse. O.K. We can live in clean environments or we can independently clean up the air within our houses. Are these approaches common? Nope. Lots of people open their windows for “fresh air”, birdsong, summer cooling, a bit of a breeze, etc. Is this necessarily bad? Depends upon the air outside. It is easy to recognize the particle signature of a house with open windows. Inside air resembles outside air. Here is one example. Where does that leave you? You have choices. 1.You could move from Pittsburgh to some pristine environment. Granted, you would probably lose your job, most of your friends, and contact with your relatives. 2. You could monitor outside air and open windows only when particles are low. The graph above suggests that this might be a full-time occupation or pre-occupation. 3.You can leave windows largely closed and use some combination of air filtration and source control to lower indoor particle levels (and add your voices to those pushing for cleaner air in Pittsburgh). 1. "Your particles are generally in the Dylos “Fair” to “Poor” range." 3.“Now that you are continuously filtering the air in your bedroom, your counts are always “Good" to “Excellent”.